If you’ve ever watched Takeshi’s Castle on cable TV at about 2 o'clock in the morning, you’ll know that the land of the rising sun are pretty good at game shows. Well, when we say, ‘good’, we mean that they like to splash crazy graphics all over the screen, screech uncontrollably and feature all manner of bizarre games. A shame, then, that slot developer Cryptologic’s Fumi’s Fortune doesn’t really tap into the phenomenon. On the surface, Fumi’s Fortune is all about the set of a Japanese game show complete with lights, neon signs and two madcap presenters. But that’s where the fun ends. There’s only one bonus round – a fairly meager free spins round – and a chance to include some innovative, well-thought out bonus features has largely gone begging. The Wild icon in this 5-reel, 25-payline online slot substitutes for all regular symbols other than the Scatters. Five Wilds across the reels pays a 1,000-line bet jackpot. Five male presenter icons also pays a 1,000-line bet jackpot, while making up the reels are a smiling female presenter, an FF logo, plus some glittery game show-styled 9-through-Ace icons. 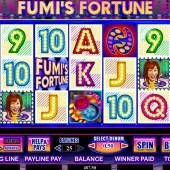 The Scatter is the Fumi’s Fortune logo and pays in any position. 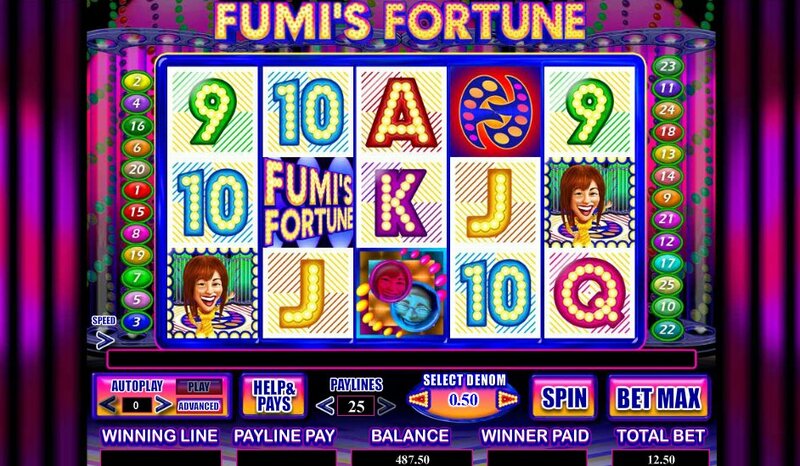 However, the game’s bonus round – a bunch of Fumi’s free spins – is triggered by hitting our male presenter – Fumi – and our female one (Aki) and/or the icon showing our pair of excitable Asian anchors in bubbles in a row. During the free games, one or more of those three icons will turn Wild for the duration of the round. Also, during the round, eight more free spins can be won by hitting further Wild icons on the reels. If you’re keen to get some game show fix on your PC or Mac, check out some of Endemol’s big show TV tie-ins. The highly intense The Million Dollar Drop slot or the amusing Catch Phrase slot – both with seriously involving bonus features – are perfectly reasonable starting points.